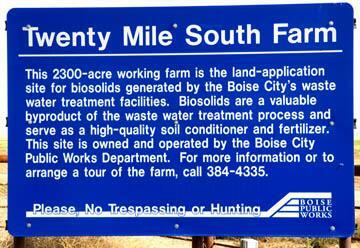 The GUARDIAN has been deluged with information about all sorts of allegations the city has allowed to go unchecked over the years at the Twenty Mile South biosolids site near Kuna since we first broke the story last June. Contrary to claims from city media “spinsters” that posting set off a massive internal audit headed by Steve Rehn–the guy the council hired to guard against fraud after the Brent Coles fiasco. Rehn raised so many red flags it looked like a parade in Communist China. So far, felony charges have been filed against the farm manager and another worker has been subject of personnel action. He is no longer on the job. Rehn’s departure should be of concern to anyone looking for accountability within city government. While he did an adequate job in the auditing process, we have yet to learn if there is anyone assigned OVERALL responsibility for the situation at the Poop Farm. SOMEONE should be coordinating the criminal, human resources, legal, and financial auditing functions. The problems uncovered there reveal a system that is in need of more corrective action than just a single criminal charge and firing. GUARDIAN sources–whom we suspect are current and former employees–tell us they followed protocol to alert their supervisors to the financial wrongdoings “for years, but nothing was done. A clear understanding of what was done, how it was done, and why it was undetected is important. We have been advised of a dual set of books, questionable crop yields, alleged offsite construction using city-purchased material, and insider lease agreements–none of which seem to be in the audit report. No way to tell if the city is even investigating any of the above since their audit is secret (part of a criminal investigation) and the auditor is leaving. GET THE FEDS INVOLVED IN THE INVESTIGATION AS THE CITY OF BOISE RECEIVES SOME LEVEL OF FEDERAL FUNDS FOR JUST ABOUT EVERYTHING. It is time to get the AG involved. The Mayor and Council are still too close to see the forest for the poop. Read the Boise Guardian… It clearly shows where the farm issues had been going on long before anything was done about it (most likely years), the city obviously knew about this long before the Mayor claims (by at least a year) and there is more to this than just a farm manager gone bad. The events at the farm went on too long and there was far too much money involved for upper management and even some council members not to of known at least part of what was going on and no doubt they did. There needs to be an outside investigation. If the city is in the clear and has nothing to hide, all is well. However, the public needs to know what the truth is and there is only one way to find out. Get the Feds involved!!!???? Keep it within the state, the last thing you want or need is Federal Government involvement. Kudo’s to Mr. Rehn. Just goes to show ” strict accountability” keeps the books semi-straight.But we need an independent auditor , perhaps appointed by the County attorney or Mr. Wasden to keep investigating this fiasco and find out just how much rot there is left! Joe, I couldn’t agree more, but how and who gets that going? Just a note: The phone number shown on the sign in this picture is an old one and has long been disconnected…. EDITOR NOTE: Thanks Judy, I am sure all those who called for tours were disappointed.